A line from Arrow Shed Ind. Do it yourself window awning kits, deck enclosure kits, garage shelter kits, and backyard storage shed kits are all worthwhile home improvements. You'll enjoy them now, and you'll appreciate the value they add to your home should you ever go to sell. We would love to help! Give us a call and talk it through with us. We provide personal service and advice on your selection. Please call or email us with your questions on deck size, clearances, installation advice and tips. We are here to serve you! Roll up Aluminum window awnings offer great sun protection or protection from the elements for window on the home. Our aluminum window awnings come in a huge variety of sizes. After you install your rollup window awning, add a door canopy kit for shade, or retractable awning kits for sun protection. 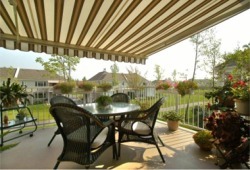 Reduces summer cooling costs up to 20% and helps protects your furnishings. Rolls up out of the way and allows the winter sun to shine in! Orders are not returnable so please verify all information before ordering and take all measurements twice! PRICING INSTRUCTIONS: Your awning is made to the inch . Measure the size you need. If it falls between widths on the pricing table simply price it out to the next highest price level. Get the size you need! Projection - - 18" 24" 30" 35" 42"
Drop - - 27" 33" 39" 44" 51"
Just wanted to drop you a note to thank you for all your assistance and wonderful service. I received my awnings and they are beautiful. The instructions on assembly were easy to follow and they look great. I can't wait to get them installed. Again - thank you for all you assistance. 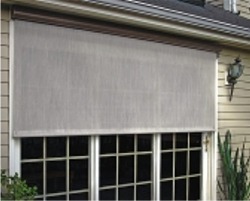 Stop the sun from fading carpets, draperies and upholstery by installing a new window awning. We have both fabric and aluminum window awnings in a fixed or roll up format. 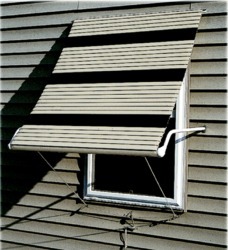 Our manual or motorized vertical rollup shade blinds are a perfect late afternoon protection from the sun. We sell pre-packaged and custom made kits. 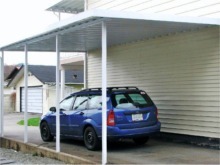 In some of our screen enclosure and patio cover /carport lines there is generally a level of customization available. However, if we know your situation, we can advise on the feasibility of your idea for your patio enclosure or screen room. It may not be that it costs a whole lot more, and it needs to be determined IF it can be done structurally and practically as a Do-It-Yourself application. Current delivery is in the 3-4 week range. To ensure customer satisfaction and correct order details, we 'purposely' do not maintain a shopping cart site. Call Toll Free 1.800.922.4760 to place your order!